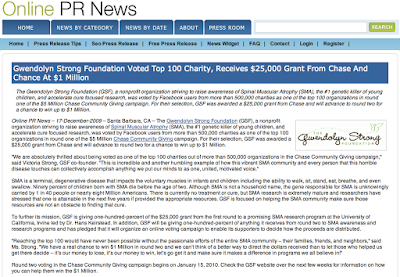 Online PR News December 17, 2009 Santa Barbara, CA The Gwendolyn Strong Foundation (GSF), a nonprofit organization striving to raise awareness of Spinal Muscular Atrophy (SMA), the #1 genetic killer of young children, and accelerate cure focused research, was voted by Facebook users from more than 500,000 charities as one of the top 100 organizations in round one of the $5 Million Chase Community Giving campaign. For their selection, GSF was awarded a $25,000 grant from Chase and will advance to round two for a chance to win up to $1 Million. "We are absolutely thrilled about being voted as one of the top 100 charities out of more than 500,000 organizations in the Chase Community Giving campaign," said Victoria Strong, GSF co-founder. "This is incredible and another humbling example of how this vibrant SMA community and every person that this horrible disease touches can collectively accomplish anything we put our minds to as one, united, motivated voice." "Reaching the top 100 would have never been possible without the passionate efforts of the entire SMA community their families, friends, and neighbors," said Ms. Strong. "We have a real chance to win $1 Million in round two and we cant think of a better way to direct the dollars received than to let those who helped us get there decide its our money to lose, its our money to win, lets go get it and make sure it makes a difference in programs we all believe in!"